Get up to 30% off gift cards to use on your favorite brands. 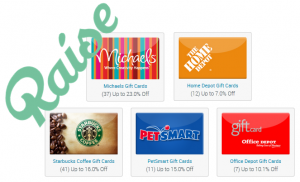 “I’ve purchased multiple gift cards over the past 1-2 years from Raise. Never had any issues even when one of the cards purchased had a zero balance on it. I emailed there customer service and they pushed thru a refund after they verified the balance within minutes.